Bronwyn Hoffman got her start in gymnastics at the age of four in recreational classes with her sister. Bronwyn’s coaches instantly recognized her talent and shortly after, Bronwyn was moved up to pre-team and then eventually, team. 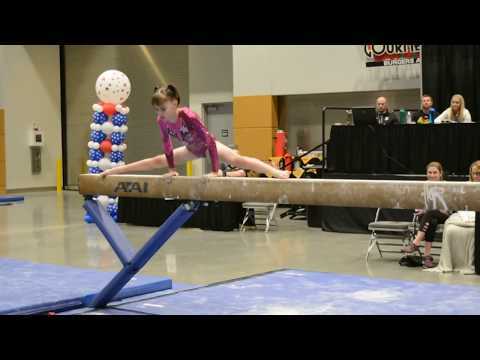 Bronwyn began competing during the 2013 Fall season as a level 3, winning the bars title at her first meet. Throughout the season, Bronwyn progressed, including scoring a 10.000 on vault and a 9.825 on bars at the 3rd Prelim. At the 2013 SoCal North Level 3 State Meet, Bronwyn took home the vault, bars, and all around titles. In the Spring 2014 season, Bronwyn competed one meet, the Gymnastics Legends Invitational where she won all four events and the all around. As a level 4 during the Fall 2014 season, Bronwyn took home the vault, beam, floor, and all around titles at the State Championships. In February 2015, Bronwyn competed her first level 5 meet at the Gymnastics Legends Invitational, winning the all around with a 38.425. Bronwyn went undefeated throughout her level 5 season, wrapping the season up at the SoCal North State Championships with an all around win of 38.300. Bronwyn’s optional career began as a level 7 at the 2016 Gymnastics Legends Invitational. At this meet, Bronwyn took home the vault, bars, floor, and all around titles. At the SoCal Level 7 State Championships, Bronwyn took home the all around title with a 38.850, qualifying to the SoCal State Team for the Region 1 Championships. At Regionals, Bronwyn took home the vault and floor titles in a tough age division. During the 2017 Spring season, Bronwyn competed level 8 as well as attending Developmental Camp at the National Team Training Center. At her first level 8 meet, Bronwyn won all four events and the all around. Bronwyn had the best meet of her career at the Level 8 SoCal State Championships, winning all four events and the all around with a massive 39.475.For the second year, Bronwyn made the SoCal State Team for Regionals where she won the vault title with a 9.750. Bronwyn began her 2018 season at the Brestyan's Las Vegas Invitational where she competed level 9 and in the elite compulsory session. Bronwyn earned her elite compulsory score for Hopes, and placed second all around in her level 9 session. Bronwyn went on to compete at the SoCal State Championships, but only competed bars. Bronwyn was able to petition to the Region 1 Championships where she placed sixth all around and qualified to the Level 9 Western Championships. While Bronwyn did qualify to Westerns, she did not compete, completing her level 9 season. At the end of May, Bronwyn competed in the Auburn National Elite Qualifier with the goal to earn her optional qualifying score for Hopes 12-13. Bronwyn did just that and more, winning the vault, beam, and all around titles. Six weeks later, Bronwyn competed in the Hopes Classic. Here, Bronwyn had a solid meet, but just missed out on qualifying for the Hopes Championships. Bronwyn began her 2019 level 10 season at the Lady Luck Invitational where she took seventh on bars. 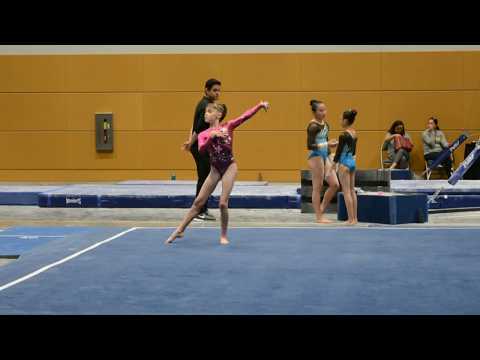 One month later, Bronwyn competed at the Biles National Elite Qualifier where she earned her Hopes 12-13 score, qualifying to the Hopes Classic. Currently, Bronwyn trains at Paramount Elite Gymnastics. In the future, Bronwyn’s goal is to make the 2024 US Olympic Team and get a full ride scholarship to UCLA for gymnastics. Chalk Warrior is a gymnastics profile platform giving athletes and parents a place to share and keep up with the scores and statistics from season to season.